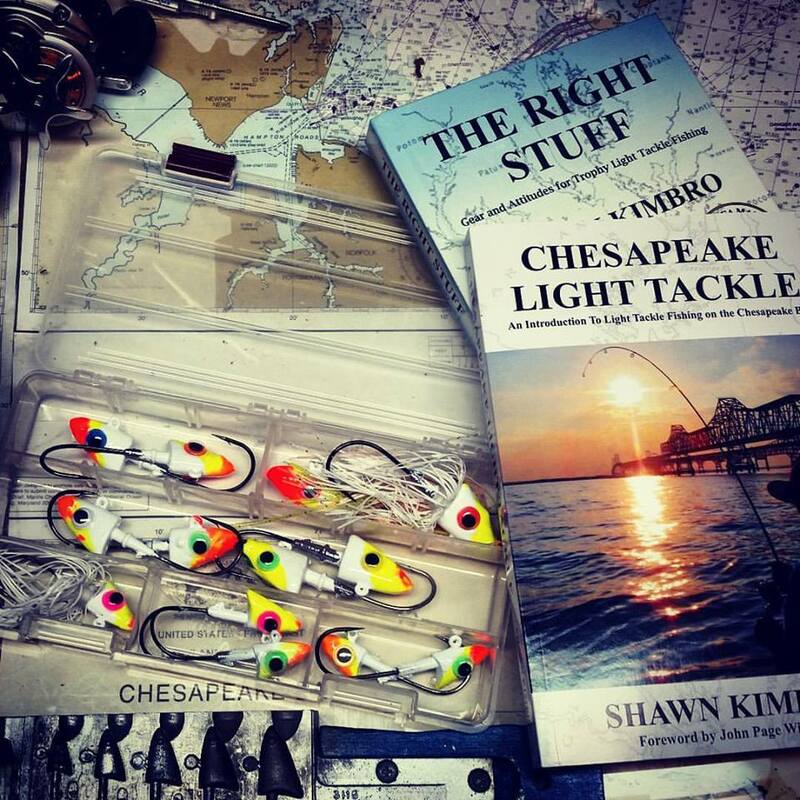 Fall is here and so is hot action beneath the birds on the Chesapeake Bay. Nothing gets a fisherman’s blood boiling like spotting hundreds of frenzied gulls on the horizon. Certain to be underneath is a voracious school of hungry rockfish and bluefish. There’s nothing more frustrating however than throwing everything in the tackle box at them only to pull in a few little fish. Here’s a top-water tandem that I refined in schools of breaking white bass back on the Tennessee lakes. It was shown to me first by my father and I’ve modified it somewhat for the more toothy critters in the Chesapeake. Start with a mid-size top-water lure. Use a “chugger” style plug, one with a cupped face that throws up lots of water. In the photo, I’m using a Lightning Chartreuse 3/4 ounce Lonely Angler MiniMega Eye. I prefer high-floating lures in bright colors. Use a 20lb test leader if there are bluefish present. Next, take an 18 inch piece of leader and tie it onto the back treble hook. Sometimes I might even remove the back treble and tie it directly onto the hook loop. On the end of that leader, put a 1/16 – 1/8 ounce bucktail. Use a slightly weighted bucktail because you want it to sink some. White or chartreuse are the best colors. A light-spinning reel with 10 or 12 pound test line is sufficient. Always position your boat up-wind or upcurrent of the breaking school. Don’t get too close or you’ll send them scattering for deeper water. Turn off your engine. Stay on the edges and let the boat drift into the school or allow the school to swim toward the boat. Proper etiquette when there are other boats around is to stay well back on the edges until the school gets close. Nothing gets other fishermen more upset than another boat running right into the midst of a breaking school. Did I mention turn off your engine? It certainly bears repeating! Toss your lure/bucktail combo right into the middle of the school and start popping it back toward the boat, and get ready to fight fish! If you don’t get bites right away, try altering the size of the bucktail to match the size of whatever the fish are eating. There are three primary reasons why this technique works so well for catching breaking fish. First and foremost, it keeps the lure in the strike zone. The fish are on the surface or just beneath, so the bucktail is right where they can see it. Secondly, fish are usually feeding on bay anchovies or similar sized minnows, so you’re matching the size of the bait. Third, and this is probably the most important, you’re actually adding to the frenzy by chugging the lure. I’ve seen fish induced into breaking when the top-water plug starts spitting and popping. The commotion looks like other feeding fish, and they come in schools to investigate. So next time you’re out there working birds & breakers, try this! It’s one of the few techniques I know of that is almost guaranteed to work for schooled fish who are actively feeding on the surface. Drop me a line and let me know how it works for you! - Top Secret Weapon Revealed!